If you’ve ever wondered why it seems like nothing ever seems to get done in Ottawa, look no further than this story. Essentially, John Martin, a Glebe business owner, has filed a legal challenge against Lansdowne Live, claiming that it violates the City’s purchasing bylaws. Now, I’ve remained quiet on the latest version of Lansdowne Live until now, but I think it’s time I said my piece. I’ll get back to the legal challenge in a moment, but first, let’s take a look at the plan itself. So what do I like about the plan? Well, it’s mixed use—in accordance with the City’s master plan and stated goals to control sprawl through intensification. It adds a significant amount of greenery what is currently a concrete wasteland, preserves the heritage aspects of the site, provides space for the farmer’s market, and will provide amenities that the area is currently lacking, such as a modern movie theatre (which is Ottawa’s urban core sorely lacks). Of course, it will also completely refurbish Frank Clair Stadium, which is currently in a fairly decrepit state. Frank Clair Stadium looking rather worse for the wear before a Gee-Gees football game on Sept. 6. It isn’t a perfect plan, of course. The fact that it’s being built by a single developer means that the site could become very architecturally repetitive, which could make the site a little less interesting. It’s also somewhat unsettling that public land will be used for a private development, but then again it’s not as if the land will actually be sold, and it’s not like greenspace will be paved over or anything like that—in fact, it’s much closer to the opposite. Overall, it’s a nice, solid plan that aims to accomplish quite a lot in a thoroughly urban manner. It isn’t flawless, but it also seems as though early fears over big box stores and power centres were rather unfounded. The elephant in the room, meanwhile, is the procurement process, and the legal challenge I opened this post with. I’ll grant that we haven’t necessarily taken the best route to get to this plan, and that the design competition probably should have been cancelled. But I do think many people are romanticizing the design competition process. For one, it was not a design competition in the sense of architects simply submitting ideas for the site, and the City selecting the one they liked best. Rather, it was a “rights to develop” competion, meaning that developers would be coming forwards with plans for the site, complete with a financial plan: how to fund the redevelopment, and how to keep it viable afterwords. That’s why the Lansdowne Live plan was such a knockout when it first appeared, as there was very clear local financial backing, as well as a tenant for Frank Clair in a resurrected Canadian Football League franchise, something that no other developer would be able to offer. Another aspect of the competition worth mentioning is the fact that any Request For Proposals would very likely have called for a site plan that included both Frank Clair Stadium and the Civic Centre, as the City did not have any plans to move either facility. As well, removing the stadium would cause Ottawa-Gatineau to become North America’s only metro with a population greater than one million with no large stadium facility—not a situation we’d want to be facing. The stadium is notably missing from Martin’s own proposal for the site, meaning it likely would have been rejected from the competition. Martin did propose building a stadium at Bayview instead, but there are far too many unknowns for that to be a viable alternative right now. So while we may not have taken the ideal route to get where we are, I don’t think it’s anywhere near as disaterous as people like Martin and Clive Doucet are making it out to be. And I fear that taking legal action against the plan will lead to the delay of it’s implementation, while an extremely valuable piece of Ottawa’s infrastructure crumbles before our eyes. Furthermore, if it is blocked, then it will undoubtably be years before we see any action at the site, furthering Ottawa’s unfortunate reputation as a backwater that can’t seem to get anything done, and killing any hope of getting professional football and soccer into the nation’s capital any time soon. That’s a scenario that I’d rather not contemplate. Heh, you want to talk about getting nothing done, look at LRT. The initial plan would be nearing completion now if it were not cancelled. The city just settled a lawsuit for backing out on that plan, and now it IS going to go and build the North-South portion anyways, and is ready to go right now. I agree though, the Lansdowne Live proposal is the only truly sound proposal financially. Yeah, that’s an issue as well. I didn’t really want to get into it here, though, to avoid muddying the waters. Not entirely thrilled with its current state personally. Seeing as it’s the portion where my parents and I attended our last CFL game as a family before my father died that got torn down as a safety hazard…you may understand my sentimentalism on this point. The fact that it’s being built by a single developer means that the site could become very architecturally repetitive, which could make the site a little less interesting. Speaking as someone who has worked with developers and municipal staff before, there is the possibility that the site could become architecturally repetitive, however, this is not always the case. Typically, for developments of this size and nature, there will be standards set that govern the architectural design of the buildings (including materials, facing, signage, etc) as well as site servicing standards, municipal guidelines, etc. Not to mention that the design of the development will have to comply with municipal standards, building codes, and the site plan approval process for Ottawa. While the developer can lead the charge by telling his architect what he wants the buildings to look like, if the City (or a large number of residents in the city) is concerned with a bland, uniform look in the development, there is a process that can be followed to make recommendations for changes. Every developer is different. I don’t know much about Landsdowne Live, its developer, or the procedures in Ottawa (my experience is mainly in Guelph), but there is the opportunity for public input during the design stage of projects of this size to voice these concerns. I can’t say for sure from the image you’ve posted, and I can’t find the original on the Lansdowne Live site, but it looks like there is almost no parking on site. It’s hard enough to get people to go to a CFL game with out making them look for parking on the street. There will be an underground lot with about 1500 spots, or about 700 less than there currently is on site. I think they’re hoping that the shuttle buses down Queen Elizabeth Drive will help mediate that difference. This is part of why I’d like to see an LRT component connecting Centretown to Billings Bridge. Whether it’s aboveground or underground is something we can work out as we go. Regarding one point, one can look at what Concord Pacific did with Yaletown in Vancouver and see the dangers of having one developer – it is definitely very repetitive. But since the intent at Yaletown was to have a “consistent” vision, you cannot really blame Concord. However, it is notable that not even the construction process is going out to tender. That to me is unthinkable. Every previous project the city has done has been tendered. So we get a sole sourced design AND the proponents of the design get to do the construction. This is positively Drapeau-esque. The most recent example is the Shenkman Centre for the Arts which was tendered out, both for design and construction. But the city precludes that on this, far greater, scale? Odd…. I have to say that the non-tendered process is my largest concern. I don’t know enough about the LL proposal, but I would have liked to have seen a number of competing visions for the park so that we could have chosen the best. In any case, the stadium feels like a bad choice. Ottawa hasn’t been able to sustain a CFL team in the past and it doesn’t look like we’re going to be getting a soccer team any time in the near future, so I’m curious what the backup plan is. If/when the stadium loses its full-time team, what is it going to be used for? Or is it just going to waste space, like the current Frank Clair stadium? Attendance for CFL in Ottawa was never the problem with the failure of the two previous franchises. I have been informed by a contact within the USL that Ottawa is guaranteed a franchise if the stadium gets built. People also forget that the University of Ottawa will continue to use the site for football, as well as Carleton University which is bringing back its football team. With a dome over the field in the winter months, community groups and local sports teams will also have access to the field. The thing that concerns me the most is the proposed stadium being too small. Historically the stadium had seating for roughly 34,000 seats. Lansdowne Live is proposing a stadium that seats only 24,000 people. The underground parking is actually going to be 1100 spaces, along with 135 above ground, which is around 1000 less than the existing site, with the addition of the large retail component that will be competing for the same spaces. The current plan calls for 408,000sq ft of retail space. There is obviously a relationship between the sq ft of retail space in a mall and the number of parking spaces required for the patrons. More shops and restaurants means that more parking spaces are needed. Taking existing Ottawa malls as an example, it appears as though an average of around 200sq ft of retail can be supported by each parking space. Lansdowne Live proposes one parking space for every 330sq ft of retail. This is clearly insufficient to support the retail component of the site plan alone, without even considering the stadium. Arenas and stadiums also need more parking spaces as they get bigger. Scotiabank Place provides a parking space for approximately every 3 arena seats. If the same ratio is applied to Lansdowne’s 1,235 parking spaces, a refurbished Frank Clair stadium should have fewer than 4,000 seats. 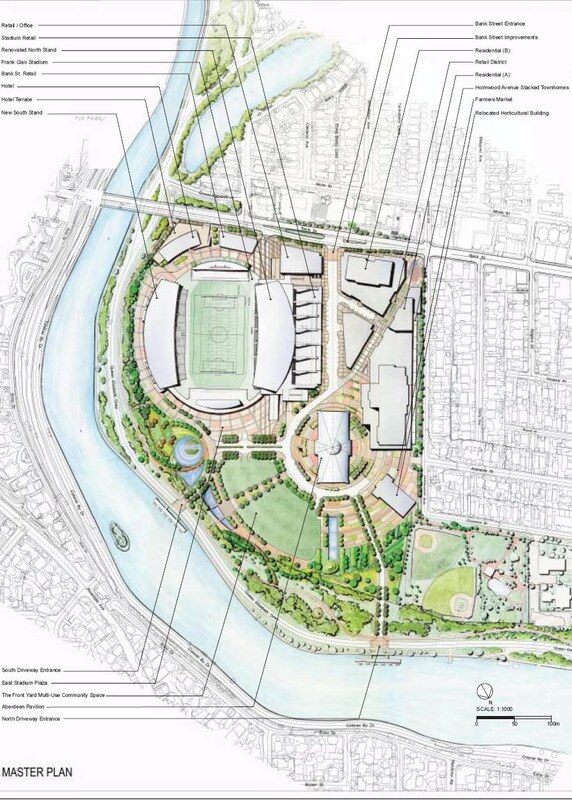 The proposed 24,000 capacity equates to one parking space for every 19+ stadium seats. And that assumes that the retail and office components use no spaces on game days. Considering the above seating equations provided by successful examples of planning in Ottawa, the new Lansdowne Park requires just over 2,000 parking spaces to support the retail and restaurant component, and a further 8,000 spaces to support the stadium, resulting in a total requirement of over 10,000 spaces, or a shortfall of around 8,800 spaces. Of course it could be argued that the peak retail times do not coincide with the peak stadium uses, and this may be true much of the time. However, many sporting events do take place on a Saturday afternoon, which is probably the peak shopping time. What happens on these occasions? People will try and park on the residential streets around the Glebe, but that isn’t what residential streets are for, and is an accident waiting to happen. Maybe some will even find their way to satellite parking lots and wait for shuttle buses, but that isn’t in the nature of Ottawa. Have you ever watched people wait for parking spots outside the mall entrance rather than park in the empty spaces 100 metres away? 16,000 sq. ft. in the Horticulture Building will become the home of the Ottawa Farmers’ Market.